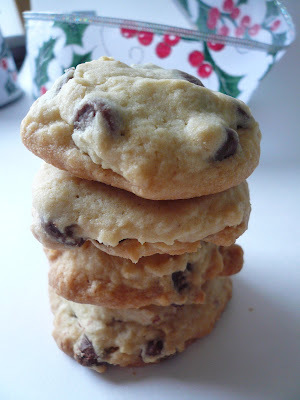 Ah, that's what I'm going to bake too... My girls love Choc chip cookies... But not sure mine is going to be as good as yours, Gert! oh lovely...can mell those lovely chocolat! 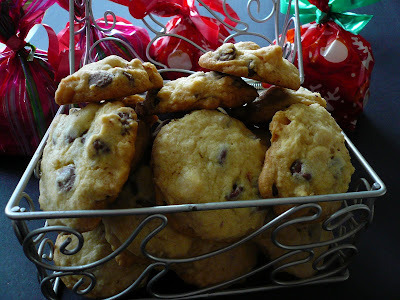 oh.. i've been thinking of making chocolate chip cookies.. and I'll try yours as it looks good. Thanks Gert!! I am SO looking forward to seeing Mr Postman in the next few days. HAHAHA! My Le-Ann loves choc chips cookies a lot. Looks good leh! Look yummy! !.I wanna some too!!lol!! Cat, your cookies will good as is made out of love with your girls. JOAT, hope you like the recipe. PJ, you buat choc. chips jugak? JOAT, I am so sorry but I already sending out all my cookies. Maybe next year you can join us for the cookies exchange for Christmas. Envy, there is no way you can stop at just eating one of the Russian Tea cakes. Is just soooooooooo good :) Happy baking. Hi hi.. ur cookies are lovely! m a beginner in baking.. may i know what is the measurement of ur 1 cup? Thanks!! Audrey, if you going to do a lot of baking you need to invest in a set of measuring cups. It comes in 1, 1/2, 1/3, and 1/4 cups. That is the cups I used in all my baking. 1 cup of butter is around 226 grms, 1 cup of flour is around 126 grams and 1 cup of sugar is around 250 grms. Hope this help. Fan of this blog! I tried making this cookie just now...but it seems like the middle part of the cookie seems to be a bit soft...baking longer makes the cookie turn brown....any ideas why? The temperature of your oven might be to high. Turn it down a bit and bake the cookies a bit longer.